Since April, Twitter users have grown accustomed to Twitter’s first ad revenue play: Promoted Tweets. Today, the second phase of that strategy is starting to be tested: Promoted Trending Topics. The first such topic? Toy Story 3, promoted by Disney/Pixar. 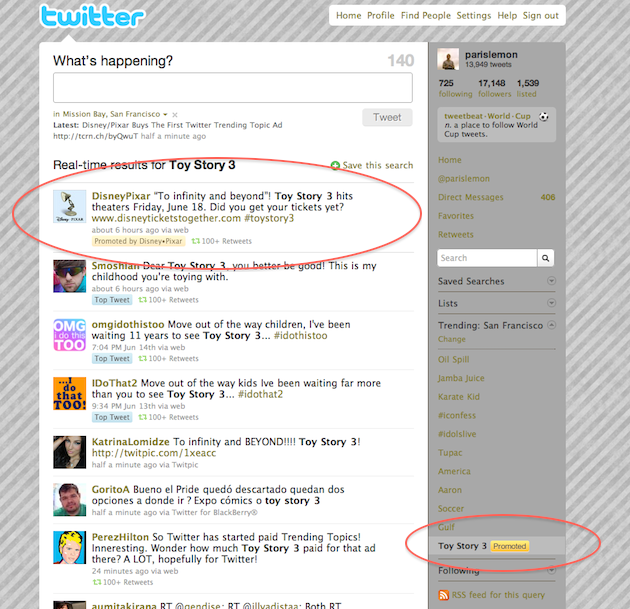 As you can see in the right hand toolbar of Twitter.com, at the bottom of the Trending Topics area there is now an 11th topic, “Toy Story 3.” Next to it is a big yellow box letting you know that it’s a promoted Trending Topic. Just as with Promoted Tweets, the functionality for these Promoted Trending Topics is the same as the regular Trending Topics — clicking on it takes you to a search results page to see what people are saying about Toy Story 3. “As we have always said, we plan to test different advertising and promotional models in these early stages of our monetization efforts for both user and brand value. As part of this effort, we are testing trends clearly marked as “promoted” for an undefined period of time,” a Twitter representative tells us. 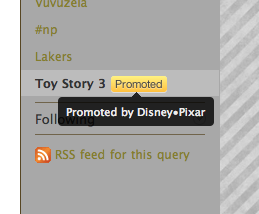 And along with buying the Trending Topic, Disney/Pixar gets a Promoted Tweet at the top of the stream, Twitter confirms. Twitter also says that just as with Promoted Tweets, the Promoted Trending Topic “has to resonate” or it will disappear. Two more things of note here. First, it’s interesting that Twitter is putting these at the bottom of Trending Topics rather than at the top. Still, the yellow badge draws your eye naturally to it. Second, the Promoted Trending Topic appears no matter which city or country you set your Trending Topics to. In the future, you can imagine these Promoted Tending Topics being even more highly targeted to just certain regions/cities.